FILE - Stacks of booklets distributed by members of Jehovah's Witnesses are seen during the court session in the Siberian town of Gorno-Altaysk, Dec. 16, 2010. Several U.S. legislators have criticized the Russian government for plans to effectively ban the Jehovah's Witnesses, a nontraditional Christian movement, as an "extremist" organization. On March 15, Russia's Justice Ministry filed a claim with the country's Supreme Court, calling on it to designate the Administrative Center of Jehovah's Witnesses in Russia an "extremist" organization and liquidate the group's national headquarters and 395 local chapters in Russia. Jehovah's Witnesses is a millenarian Christian group founded in the United States in the 1870s. It is known, among other things, for door-to-door preaching and refusing to perform military service, salute national flags or accept blood transfusions. Its adherents have frequently been persecuted by authoritarian governments, including that of the former Soviet Union. "At stake in the upcoming court case is the legality and, perhaps, the survival of the Jehovah's Witnesses — and, in fact, basic religious freedom — throughout the Russian Federation," said Congressman Chris Smith, a New Jersey Republican who co-chairs the U.S. Helsinki Commission. "If the Supreme Court of Russia declares this faith group an extremist organization, it is an ominous sign for all believers and it marks a dark, sad day for all Russians." Russia's Justice Ministry reported on its website last week that since 2009, it has identified 95 materials of "an extremist nature" that were brought into Russia and circulated in the country, according to the Tass news agency. Tass quoted the website saying, "As many as eight local cells of the organization were recognized to be extremist ones, banned and disbanded since 2009." 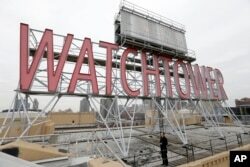 FILE - The iconic Watchtower sign is seen on the roof of 25-30 Columbia Heights, the current world headquarters of the Jehovah's Witnesses, in the Brooklyn borough of New York, Dec. 9, 2015. However, Anatoly Pchelintsev, chief editor of the magazine Religion and Law, said the accusations are incompatible with the principle of freedom of religion. "Formally, the semblance of legitimacy is observed [by the Justice Ministry]," he told VOA's Russian Service. "However, there is actually no extremist activity and, in fact, it is baseless and bogus. There are multiple videotapes showing how banned literature is planted [on Jehovah's Witnesses]." If the Supreme Court rules against Jehovah's Witnesses in Russia, its 175,000 followers face the threat of criminal prosecution. That, according to Pchelintsev, would be "total madness." "Of course, there will absolutely be prison sentences, just like it was in Taganrog [in southern Russia's Rostov region], where 15 innocent people were sentenced," he said. "But a majority [of the Jehovah's Witnesses] will go underground. They will also be congregating, praying and so on. Stalin couldn't do anything about them even though he deported them to the North. Hitler also couldn't do anything about them, even though he sent them to concentration camps and physically destroyed them." Pchelintsev recalled that the Jehovah's Witnesses were recognized in the early 1990s as having been victims of political repression during the Soviet period, and received official documents to that effect. "If they're being banned now, should their documents be revoked?" he asked. "And then, after a while, when a new president is elected, should they receive their documents back? It's a bizarre logic. We cannot live according to the constitution; we're constantly looking for an enemy, either external or internal." Pchelintsev added: "You may not share their beliefs and there can be different attitudes toward them," he said. "However, from the standpoint of law and the constitution, they have every right to exist. Otherwise, we will become the first country in the modern world to ban the Jehovah's Witnesses." Valery Borshchev, a veteran human rights activist and member of the Russian branch of the International Association of Religious Freedom, agrees that harassment of the Jehovah's Witnesses violates the principles of religious freedom. "The Jehovah's Witnesses are not involved in any extremist activity," he told VOA. "Yes, they have some controversial views that confuse others — for example, the ban on blood transfusions. But it's a debatable issue." In any case, said Borshchev, this has nothing to do with extremist activity. "All the accusations against them are unfair and anti-constitutional," he said. "It violates the principles of the freedom of belief and conscience enshrined in the constitution." According to Borshchev, those calling for the Jehovah's Witnesses to be banned do not understand the nature of religious organizations. "They would do well to learn the history of religious movement in the Soviet Union, where nobody could do anything about the alternative churches," he said. "The same thing will happen now. More than that, this adversarial position will escalate the conflict. The members of the organization will feel like they have a mission and it will strengthen their rigor." According to the Helsinki Final Act, which was signed by the 57 participating countries of the Organization for Security and Cooperation Europe (OSCE), including Russia, "the participating States will recognize and respect the freedom of the individual to profess and practice, alone or in community with others, religion or belief acting in accordance with the dictates of his own conscience." VOA's Svetlana Cunningham contributed to this report, which was produced in collaboration with VOA's Russian Service.